I couldn’t stop thinking about the possibilities that might be opened by a new Central Branch of the Howard County Library System, so I’m taking the unprecedented step of posting twice in one day. 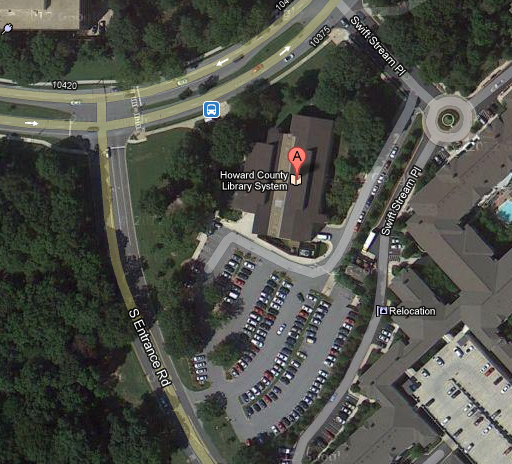 In my last post I proposed building a new Central Branch facility that included at least a dedicated co-working space and business resource center, and possibly having it also host the Innovation Catalyst program run by the Howard County Economic Development Authority in the same building, just as the Miller Branch currently hosts the Howard County Historical Society. Unfortunately though the space requirements to do this are much greater: The Historical Society occupies less than 5% of the Miller Branch building (3,000 square feet out of 63,000 square feet), while the iCat facility is 25,000 square feet vs. less than 50,000 square feet for the current Central Branch facility. Assuming that a new Central Branch facility would have roughly the same footprint as the present one, that’s a major obstacle. Then while lying in bed last night I thought: The Miller Branch is two stories, an appropriate size because it’s in a relatively rural setting. So is the current Central Branch. But a new Central Branch is going to be at the center of what will be an increasingly urban area; why not make it a three-story facility instead? Assume that the library portion would be roughly the size of the Miller Branch at about 60,000 square feet spread over two stories. Then add an additional 30,000 square feet in the form of a third story to house the co-working space, business resource center, and iCat program. I’m no developer or architect, but looking at an aerial view of the current Central Branch it seems like there’s be more than enough room to increase the building’s footprint to accommodate a three-story facility with 90,000 (or even up to 100,000) square feet. This would be a significantly larger building than the current Central Branch, but I think it would be quite in character with its surroundings: Across Little Patuxent Parkway are office buildings at least twice as tall, and a three-story building would be a nice transition to the future CA headquarters in Symphony Woods. But what about parking? The new Miller Branch has 470 parking spaces spread across three parking lots (for the Miller Branch proper, the old Miller Branch facility now used at the HCLS central office, and the Ellicott City senior center); 250 of those spaces are next to the new Miller Branch building. In comparison the current Central Branch has less than 150 parking spaces by my count. (I couldn’t find any figures on this, so I resorted to counting spaces by hand in the Google Maps image.) As anyone who’s visited Central Branch knows, parking can be very hard to find there, and almost doubling the size of the building would make it worse. However, there’s an obvious solution at hand: Part of the Inner Arbor plan is a 1,750-space multi-level parking garage. I haven’t seen anything about the intended uses for that garage, but one possibility is to use it for overflow parking from a future Central Branch facility, and maintain the ground-level parking lot at the new Central Branch at around 100-150 spaces. Would adding a co-working space and iCat space to a new Central Branch greatly increase vehicular traffic in the downtown area? I don’t think so: Typical library traffic is characterized by many relatively short visits as people drop by to return books or check out new ones; even more extended uses like kids doing homework after school might last only a couple of hours. People using a co-working space or an iCat office would likely stay there for most if not all of the day, so the incremental traffic from increasing the library space by 50% for those uses would likely be less than one would think. Downstairs high school students could participate in educational activities like the HiTech program focusing on science, technology, engineering, and mathematics, along with business education focused on that same population. Upstairs free-lancers young and old could use the co-working space and learn more about business and small-scale entrepreneurship (e.g., starting and operating successful “lifestyle businesses”). Those wanting to “take it up a notch” could participate in the iCat program and try to launch innovative new startups. If they’re successful then there would be plenty of prime office space nearby into which they could expand their businesses. And of course all this would be happening right next to a beautiful urban park and arts district, with cafés and an upscale grocery nearby, a major regional shopping center across the street, and attractive apartment and condominium complexes within walking distance. It’s a classic live/work/play (and learn!) combination, and I think might go a long way toward attracting and retaining the sort of bright ambitious young people who could contribute a lot toward the future economy and culture of Howard County.